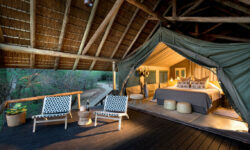 Today, Tanda Tula consists of 2 exclusive Tented Camps: Tanda Tula Safari Camp and Tanda Tula Field Camp. Both camps are owned and managed by Don and Nina Scott, together with their passionate and dedicated team. The Timbavati reserve hosts large concentrations of Africa’s game including the famous ‘Big 5’ in one of the most beautiful parts of the continent. 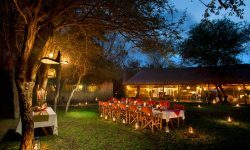 Tanda Tula Safari Camp is positioned amongst enormous trees on the banks of the Nhlaralumi Riverbed, in the heart of Big Five country. The Camp gives true African feel. Making guests feel at home with friendly staff and the atmosphere. 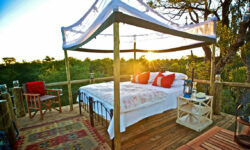 The Tented Camp consists of just 12 secluded, Luxury Tents, each with a breath taking view over the riverbed. The East African styled Tents are Luxurious, comfortable and stylish. Each luxurious tent feature has en-suite facilities with Victorian bathtub, outdoor shower and a spacious deck overlooking the riverbed and African bush. Kindly Note: In compliance with Timbavati capacity regulations, Tanda Tula sees children as adults and they are allocated a tent, even when sharing with adults. Tanda Tula is unable to offer private vehicles at an extra vehicle charge. 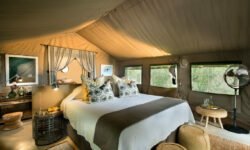 As an alternative, we recommend Tanda Tula Field Camp for a completely exclusive safari.